Over the past 15 years as I’ve spent more and more time in and around Greater China, I have noticed a distinct difference in how Chinese companies link culture together with innovation. Certainly, an “innovation culture” exists in the United States – especially prominent in places such as Silicon Valley – but it is seen as a distinct subculture, defined by its own rules and norms. That is not what I notice in China. China’s culture of innovation is tied more directly to its core values, especially humility. Case in point: Most people in the United States do not recognize the name Cher Wang, but if you own a smartphone, you owe a debt to her influence. In fact, she is as responsible for the modern smartphone as Steve Jobs. Cher Wang co-founded chip-maker VIA Technologies in 1987 and the smartphone company HTC in 1997. In a traditionally male-dominated culture, she is wealthiest person in Taiwan. Despite her obvious successes, HTC has recently struggled to keep pace with competitors Samsung, Apple and Xiaomi. In the arms race to release the next great smartphone model, HTC stumbled. Recently, the company was declared worthless as its market cap dropped 95%, eventually settling below the company’s own cash-on-hand. From that humbling lesson came a realization: Going it alone is risky. To succeed, HTC needed to rethink its strategy, crafting a partnership that could help it better compete. HTC was the maker of Google’s original Android G1 and Nexus One smartphones and has more recently teamed up with the company to produce the Pixel and upcoming Pixel 2, as well as their own successful U11 and U11 Plus and Life, launching this coming weekend. But HTC and Wang aren’t as excited about smartphones as they are about another pioneering new technology: Consumer Virtual Reality. In other words, HTC knows it cannot win playing the same game. This may sound like Silicon Valley hyperbole to Western ears, but read more carefully. HTC is choosing this new market because Wang knows HTC can make a difference there. Western leaders see moves like this as a “pivot” or a “planned failure” – both careful ways of avoiding the deeper emotional realization that you were wrong and that you need to change. Western leaders may use the word “failure”, but they don’t really mean it. Why can’t Western business culture understand and leverage humility as the powerful innovation tool it clearly is? 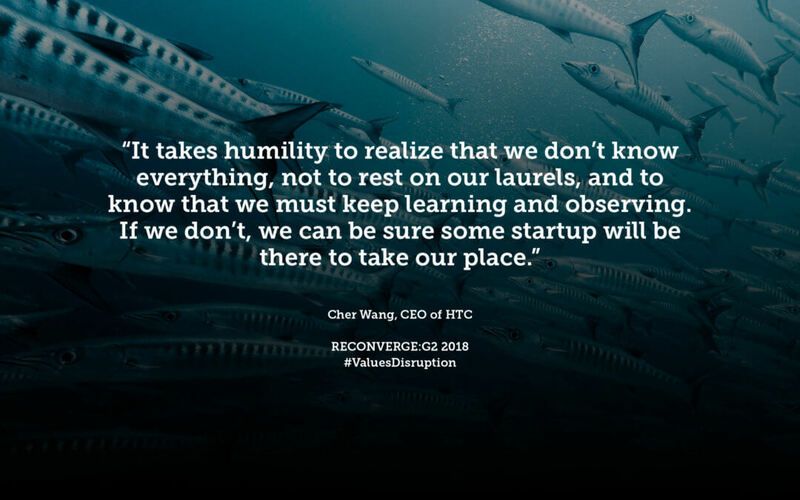 Perhaps until they’re humbled – Cher Wang and HTC have so clearly been – they’re… unteachable? “Awakening Cultures of Humility” is the theme for Wednesday, April 25 agenda at RECONVERGE:G2 2018. And we think we’ve got an outstanding plan for how to do exactly that! Finally, we’ll close the day with a happy hour and evening event designed to test your puzzle (and mystery) solving skills in a team with people you just met! What could be more fun?! But you’ll miss all of that if you don’t register … and tickets are already going fast! Register now for 2018’s RECONVERGE:G2 Intelligence Leadership Symposium, happening April 24-26 at the beautiful Fluno Center at the University of Wisconsin – Madison’s Business School. Arik Johnson is Chairman of Aurora WDC, the strategy, innovation and competitive intelligence consultancy he founded in 1995. Arik stepped aside as CEO in 2010, to launch Aurora’s insights and analytics R&D lab and policy think tank, the Centers for Open Reconnaissance (COR.vc), and today pursues his passion for helping organizations of all kinds find their next championship opportunity in the markets and industries where they compete.